Educators across the nation are up in arms over years of austerity and underinvestment in our children’s education and in our public schools—and Texas educators are no exception. Texas teachers are experiencing many of the same conditions that drove teachers into the streets in West Virginia, Oklahoma, Arizona, Colorado, Kentucky, and North Carolina, where teachers organized and took action. Our state government cut education funding deeply during the Great Recession and is now refusing to make the investments necessary to meet children’s needs in our public schools and community colleges. Huge tax breaks for corporations have been the legislative priority—especially for the oil and gas industry, whose billionaires fund our most virulently anti-public education politicians like Gov. Greg Abbott and Lt. Gov. Dan Patrick. School employee pay is stagnant. Texas teachers earn significantly less than other college-educated workers in our cities and receive wages that are thousands of dollars below the national average for teachers. Many school support staff do not earn a living wage. Health insurance costs for active and retired educators continue to escalate. Meager pay raises, when they come, are consumed by the rising cost of health insurance, and few school employees are able to afford family health coverage. Our so-called accountability system perpetuates a fixation and over-emphasis on standardized testing. The Texas Education Agency seems bent on labeling and punishing schools, supplanting locally elected school boards and forcing charter schools on communities by threatening to close their schools. Enough is enough! Texas educators are declaring to our elected officials that we will not accept the state’s continued failure to meet the needs of our schoolchildren, their families, and of the professionals who serve those children in our public schools and colleges. 3) Repeal punitive accountability sanctions including forced closure of schools, forced takeover by charter schools or other outside management organizations, use of a single letter score to label school districts and campuses, and stigmatization of students and teachers based on test scores. The Texas Supreme Court ruled in May of 2016 that our school finance system is barely constitutional. A bipartisan bill that would have invested $1.8 billion in schools was stopped by legislators seeking private-school vouchers a year later. Instead, the Legislature created a 13-member commission to recommend improvements for the school finance system. While the Legislature will be armed with these recommendations, it’s clear that the number one priority at the Capitol in 2019 will be increasing per-pupil funding—including an increase in the state share of funding to buffer the rise in local property taxes—an update in finance formulas, and greater equity in funding among school districts. • Restore per-pupil funding fully to the pre-recession level of 2008 (an increase of $3.2 billion a year). • Restore the state share of formula funding for school districts to at least 50 percent. • Conduct a cost-of-education study to set the benchmark for optimal funding of the schools our kids deserve—covering the basics, meeting special needs, and providing equal opportunity for enrichment. • Update outmoded funding formulas to reflect the full cost of educating nearly 5.3 million students—59 percent economically disadvantaged, 9 percent with disabilities, 19 percent English Learners. • Assure funding equity, so that students have access to the educational resources they need regardless of where they happen to live. • Guarantee state aid will keep up with enrollment, inflation, and rising state and federal requirements. • Provide full state formula aid for community colleges, including employee benefits. • Block private-school vouchers and equivalent drains on public education funding via privatization schemes like corporate-chain charter school takeovers, virtual schools like K12, Inc., “achievement districts,” “home rule” charters, and deceptively labeled “parent triggers” for charterization. To meet the growing needs of Texas students for the long term, build a new revenue structure assuring state funding that will keep pace with our students’ needs. • Close property-tax loopholes that shift the burden from commercial to residential ratepayers. • Close loopholes in business taxes. • Sunset unjustified sales-tax exemptions for business and professional services (but keep “lifeline” exemptions for health care, child care). • Suspend the granting of new charters and the expansion of existing charters. Study the impact charter schools are having on student segregation, student discipline, disruption of neighborhood schools, public school funding, and student achievement. • Require publicly-funded charter schools to be governed by elected boards, hold open meetings, and to ensure that all school property, including buildings, belongs to the taxpayers who fund the schools. • Provide full-day, voluntary Pre-K and Kindergarten for all. • Guarantee early extra help for struggling students. • Ensure staffing to serve high-need students in regular classrooms. • Enforce K-4 class-size caps, cap class size in Pre-K and higher grades, and bar overuse of online courses in lieu of in-person instruction. • Expand bilingual, ESL, and dual-language instruction. • Raise standards for entry into the teaching profession. Provide mentoring and research-based, teacher-directed professional development. • Expand scholarships for instructional aides to become teachers. • Assure teachers and paraprofessionals time to prepare and collaborate. • Level the playing field to make privately run charter schools meet the same standards as local neighborhood public schools; block charter school expansion at the expense of the neighborhood public schools. • Block nullification of state quality standards and safeguards under the guise of local innovation. • Block implementation of misleading A-F grades for schools, which merely stigmatize students, schools, and neighborhoods. • End misuse of state assessments as the main measure of success in a punitive accountability system. • Tighten limits on local benchmark testing tied to state assessments. • Use multiple measures to gauge student growth and guide instruction; include portfolio, performance-based assessments and measures of social/emotional learning. • Ban use of “value added” models for individual educator evaluation. • Use tests that are specifically designed for pupils with disabilities and for English Learners. • End top-down, punitive sanctions; use community-developed solutions to improve schools, and use local, community-defined accountability measures. • Expand use of the Community School model to build wraparound services for students and their families into neighborhood schools. • Engage parents as full partners in developing school-improvement plans. • Hold school districts accountable for providing a supportive environment for learning that reflects real employee, parent, and community input. • Promote positive behavior supports and restorative practices and ensure administrator training in consistent, non-discriminatory use of the Safe Schools Act, while upholding teachers’ and bus drivers’ authority to remove disruptive students. • Fully staff schools with counselors to meet students’ social and emotional needs. • Enact sensible gun laws to close background check loopholes and restrict minors and others shown to be unfit from acquiring firearms. • Cease the foolish rhetoric about arming teachers and provide schools with the resources to hire professional law enforcement officers, where appropriate, to protect students. • Enforce state law requiring seatbelts on new school buses. • Notify parents if their child’s school lacks full-time nurse staffing. • Sunset the special-education video recording law to ensure that benefits are weighed against costs before the program continues. • Boost state health-care funding for all education employees and retirees; reverse the long-term shift in costs onto employees and aim ultimately for the state to cover the full cost for every employee and half the cost for dependents—health coverage as good as the governor’s! • Sustain and improve defined-benefit TRS pensions—benefits you cannot outlive. • Provide for a catch-up cost-of-living increase for all TRS retirees. • Let education employees/retirees elect a majority on the TRS board. • Expand and improve health benefits for adjunct higher-education faculty. • Secure the repeal of unfair federal Social Security benefit cuts that victimize school employees. • Raise educators’ pay to match pay for comparable private-sector jobs in Texas. • Pay a living wage to all education employees, Pre-K/16. • Stop out-of-field assignments of educators and support staff. • Clearly define the work day, work year, and work assignment; ensure extra pay for extra work. • Strengthen employee contract, compensation, and due-process rights. • Ensure basic due process and other employee rights in state law for all education employees, Pre-K/16. • Train administrators to respect employee rights; penalize retaliation for employees’ exercise of rights under state law. • Maintain the ability of school boards to develop policy in consultation with employees’ democratically elected representative organization. • Let school boards bargain with an elected organization on local contracts. Police, fire fighters and other public employees in Texas already have this right. • Assure adequate and effective training upon hiring and throughout employment. • Stop inappropriate assignments to serve in roles for which employees are not trained. • Establish standards for custodian workloads based on square footage of buildings maintained. • Increase funding for paraprofessionals’ tuition scholarships to become teachers. • Uphold bus drivers’ discipline authority under state law. • Provide planning periods for paraprofessionals. • Enhance safety in transportation by enforcing the seatbelt requirement for new school buses and by providing bus monitors. • Pay all employees in public schools a living wage. • Ensure basic due process for support professionals in decisions affecting their employment. • Provide administrative leave with pay for support personnel pending a decision on proposed adverse employment action. • Boost state health-care funding for all education employees and retirees; reverse the long-term shift in costs onto employees and aim ultimately for the state to cover the full cost for every employee and half the cost for dependents—health care as good as the governor’s! • Make it the goal of state policy to enable all school employees to retire under the Rule of 80 at 70 percent of their active salary with an annual cost-of-living adjustment. • Provide a catch-up cost-of-living increase for all TRS retirees. • Limit tuition increases and increase financial aid. • Maintain in-state college tuition rates under the 2001 Texas Dream Act for undocumented students who are Texas high school graduates and longtime Texas residents. • Maintain tuition set-asides to reduce college costs for low-income and middle-income students. • Oppose simplistic performance funding. • Ensure research-based, appropriate use of online instruction as a supplement to, not a substitute for, in-person teaching and learning. • Maintain the role of community colleges in developmental and adult basic education. • Increase state funding for employee salaries. • Expand/improve health benefits for adjunct faculty. • Increase the ratio of full-time professors to part-time adjuncts by creating more full-time positions with full benefits. • Guarantee payroll deduction of dues for each employee’s chosen professional organization. • Guarantee basic due process in personnel decisions affecting all faculty and staff. • Simplify transfer of course credits from community college to university. • Restore prior law barring concealed handguns on public college campuses except in the hands of law-enforcement officers. • Require parental notification if their child’s school lacks full-time nurse staffing. • Assure adequate nurse staffing on every campus to meet professional standards of care. • Uphold nurse qualifications (discourage replacement of RNs with LVNs). • Provide state-funded Epi-pen training and access under medical supervision to treat allergy-induced anaphylactic reactions. • Include school nurses in the provision of state law that already guarantees a 30-minute duty-free lunch to other professional school personnel. Sitting on the sidelines is not an option. Educators need to take action. We need to stand up, stand together, and speak out for our students, for all education employees, and for public education. Legislators listen best to messages from folks in their home district. Inform yourself about the issues and ask your state senator and state representative for their support. 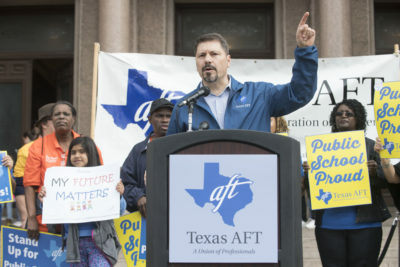 Visit us at www.texasaft.org to stay up to date with the Legislative Hotline and Action Alerts, and to write to legislators directly by fax or e-mail. Dial 1-888-836-8368, give your state senator’s or representative’s name, and ask to be connected. Team up with other leaders in your local to visit legislators in their home offices. Host a meeting with union members and local legislators to let them know your priorities before and during the legislative session.